26-Mar-2009 -- This is the 58th of a series of 83 confluence visits during our voyage from Nigeria to Europe and back to Nigeria around the entire African continent. It all started on 28 January 2008 at 11N 5E. Story continues from 5S 39E. We spent the night at the Colobus camp which is situated at the foot of Mount Meru (4506 m). We were leaving this wonderful place and drove to Arusha where we were getting both of our spare tyres fixed at a very reasonable price. It seemed that we got lost driving out of Arusha and ended up driving through very nice coffee plantations before we got onto the main road again. We continued towards the village Makuyuni and turned off towards Mbu. At Mbu we turned off onto a gravel road and drove 47 km to the village Engaruka Chini. This road leads along the border of the Ngorongoro conservation area through the Engaruka basin. We have seen lots of game roaming around in this wilderness area. 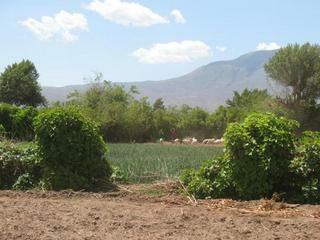 On the outskirts of the village, 80 meter next to the road, at the village vegetable gardens, the Confluence is situated.